TEARN media released the Cupertino Restaurant app for ordering from smartphones; with 15% of the restaurants participating. For web access, visit http://cupertino.moAPPo.com. Cupertino is a city in Santa Clara County, California in the U.S., directly west of San Jose on the western edge of the Santa Clara Valley with portions extending into the foothills of the Santa Cruz Mountains. The population was 58,302 at the time of the 2010 census. Why Cupertino as the first city for mobile commerce? Forbes ranked it as one of the most educated, wealthy small towns. It is best known as home to the worldwide headquarters of Apple Inc, as well as the laboratory for Lab 126, Amazon's Kindle Fire development team of thousands. Other Fortune 1,000 companies include Seagate, Agilent, and Symantec - while hundreds of high-tech start-ups work from their Cupertino homes. About 200 restaurants serve the various ethnic groups who live and work in Cupertino. 15% of these Casual Dining (CDR), Quick Serve (QSR), and Fine Dining (FDR) restaurants have signed on to provide smartphone access to their menus and/or payment for their orders. This list includes BBQ from Hawaii, Greece, Armenia, Mexico, and India; Chinese, Indian, Thai, Italian, Californian, Mexican, and American venues; and unusual snacks like Beard Papa or Verde Pearl Tea. MoAPPo integrates four digital businesses with mobile apps, Wi-Fi hotspots, payment, and online ordering experiences. One of the companies dominates the Wi-Fi hotspots in Silicon Valley while another has already gained 8 million downloads. The Cupertino Restaurants App allows users to sign-up once, save their payment data, and save time at any of their favorite restaurants. The innovative app supports various iPhone/iPad/iPod configurations; multiple versions of Android phones; multiple Kindles from Amazon; Palm, Blackberry, and Window Mobile; and many featured phones from Nokia, Pantech, and LG. No other company provides the same level of device support for menu display. Try the app. Provide feedback. Watch us grow to service all Bay Area restaurants. Chrome OS from Google - What is it? Google released the Chrome OS and Chrome Web Store. What are these products? Why do we need them? Traditional PCs, laptops, and desktops, use Windows as the operating system. The OS has gotten bigger, more complex, and executes very slowly on old hardware - thus requiring the purchase of more and more computers just to do the same work. That trend makes no sense. Users buy learning apps on CDs and install them on the PC. This is expensive, difficult process, and the programs quickly become out-of-date. The Chrome Web Store hosts applications that can be purchased and used inside the Chrome browser. These apps reside on the web cloud and can be updated without the user having to fuss with the software. The Web Store tracks who owns what and automates access to the latest versions. This is ideal for educational and other apps where the data can be constantly changing. Google already supplies an office suite of word processing, spreadsheet, database, and presentation software - all of which are free. They have also purchased Picnik, which provides a graphics application that is both free and a paid service. Replacing an expensive PC, complex OS, and inadequate browser with inexpensive hardware and latest browser - does that make sense? Updates are automatic as the system self updates over the cloud. This saves everyone time and money. Companies who create products like TV shows, movies, music, books, graphics, or learning apps depend on consumer purchases to sustain their art. The earnings from advertising-supported websites have proven to be far from sufficient to support the cost of creative ventures. Those who argue for everything free ignore the economics of creative services. Would Mel Gibson work for free? A lot of content is free, but it's not possible for everything to become free. Applications can depend on purchases for revenues - not just advertising. The user interface of an app is completely different from websites. Whereas websites try to route users among hundreds of links per page, the applications focus on one task. Thus, applications are far simpler to use than websites. Most apps depend on touch or sensors as controllers - versus keyboards or mice. Most use animation to make everyday use palatable. A new breed of designers have replaced legacy web and Flash designers to produce apps that are useable. Note that a web application can be a website, but a website is not always an application. Is it Just Like an iPad? iPad has led the wave of change. Most Wall Street analysts expect the iPad to gain a significant share of the PC business. A centralized company like Apple has the advantage to effect such major changes. One key change from iPad is that developers can create advanced apps without supporting legacy browsers like Explorer and Firefox that don't have the advanced features. Chrome OS does the same for desktop and laptop users. Thus, this change enables innovation that benefits all users. We believe that the iPad has just touched the surface of a new generation of computing. Continued innovation depends on choice from distributed ventures. As more hardware, software, app developers, and wireless engineers tackle the problem - this new generation will displace the majority of wasteful desktops and laptops that are used today. Complexity that cost time and money will be displaced by simplicity and lower costs. Say goodbye to your PC. It will be relegated to the same niche as mainframe computers. We are under non-disclosure with dozens of companies, who plan to release new computers that use the Chrome OS or equivalent - mostly in the spring of 2011. These computers will be inexpensive, easy to setup, fast starting, and easier to use. To start with Chrome OS, you don't need to wait. Google already provides the Chrome browser as a free software that is used by millions of people. It downloads apps from the Chrome Web Store and provides a Cloud OS on today's desktops or laptops. Follow the links below to download the latest Chrome browser and explore the apps in the Chrome Web Store. The process is easy. Like iTunes, your apps move with you when you update your hardware - avoiding the days wasted installing old software on new computers. Thus, if you start now, you'll be saving time and money with your next PC purchase. You immediately gain the benefit from the latest applications based on the latest web technologies. 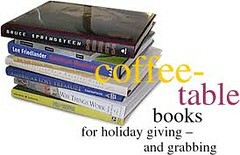 Some may advocate coffee-table books for holiday gift giving. We agree with the learning theme, but disagree about the medium. Each book kills a shrub, uses oil, possibly chokes a dolphin, and clutters the coffee table. Rather than spending $500 this coming year to buy 25 coffee-table books, we recommend spending the same money for a tablet like the Dell Streak or Apple iPad. We already have over 500 coffee-table apps like cooking apps, sports magazines, and travel books that we we happy to provide mostly for free. Each download saves a shrub, a can of oil, possibly a dolphin, and one mind. Saving money and the environment -- isn't that the right spirit and pledge for the holidays and the coming year? Share with Facebook friends, if you agree. Here is our beta version of apps for tablet devices. Click here to visit. Although compatible with desktop browsers like Explorer, Firefox, Chrome, and Safari, the best tablet experience would need iPhone OS4, Android, or Blackberry OS6. For best simulated experience from a desktop PC, please use Safari from Apple.